●	The “iconic” look of the label remains but FDA is making updates it says will ensure consumers have access to the information they need to make informed decisions about the foods they eat. These changes include increasing the type size for “Calories,” “servings per container,” and the “Serving size” declaration and bolding the number of calories and the “Serving size” declaration to highlight this information. ●	Manufacturers must declare the actual amount, in addition to percent Daily Value of vitamin D, calcium, iron and potassium. They can voluntarily declare the gram amount for other vitamins and minerals. ●	“Added sugars,” in grams and as percent Daily Value, will be included on the label. FDA said scientific data shows it’s difficult to meet nutrient needs while staying within calorie limits one consumes more than 10 percent of his/her total daily calories from added sugar; this is consistent with the 2015-2020 Dietary Guidelines for Americans. ●	The list of nutrients required or permitted to be declared is being updated. Vitamin D and potassium will be required on the label. Calcium and iron will continue to be required. Vitamins A and C will no longer be required but can be included on a voluntary basis. ●	While continuing to require “Total Fat,” “Saturated Fat,” and “Trans Fat” on the label, “Calories from Fat” is being removed because research shows the type of fat is more important than the amount. ●	Daily values for nutrients like sodium, dietary fiber and vitamin D are being updated based on newer scientific evidence from the Institute of Medicine and other reports such as the 2015 Dietary Guidelines Advisory Committee Report, which was used in developing the 2015-2020 Dietary Guidelines for Americans. Daily values are reference amounts of nutrients to consume or not to exceed and are used to calculate the percent Daily Value (% DV) that manufacturers include on the label. The %DV helps consumers understand the nutrition information in the context of a total daily diet. ●	By law, serving sizes must be based on amounts of foods and beverages people are actually eating, not what they should be eating. How much people eat and drink has changed since the previous serving size requirements were published in 1993. For example, the reference amount used to set a serving of ice cream was previously 1/2 cup but is changing to 2/3 cup. The reference amount used to set a serving of soda is changing from 8 ounces to 12 ounces. ●	Package size affects what people eat. So for packages that are between one and two servings, such as a 20-ounce soda or a 15-ounce can of soup, the calories and other nutrients will be required to be labeled as one serving because people typically consume it in one sitting. ●	For certain products that are larger than a single serving but that could be consumed in one sitting or multiple sittings, manufacturers will have to provide “dual column” labels to indicate the amount of calories and nutrients on both a “per serving” and “per package”/“per unit” basis. Examples would be a 24-ounce bottle of soda or a pint of ice cream. 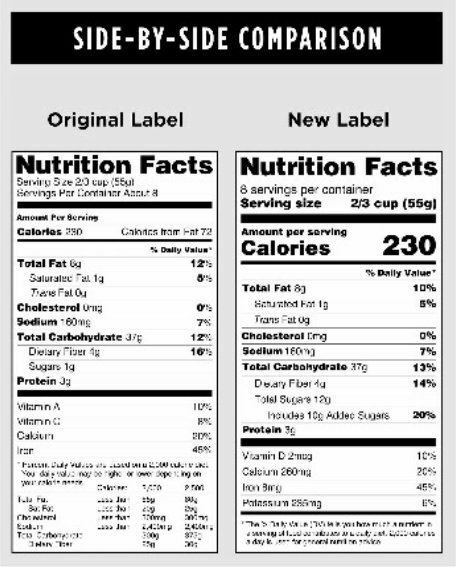 FDA said that with dual-column labels available, people will be able to easily understand how many calories and nutrients they are getting if they eat or drink the entire package/unit at one time. Manufacturers will need to use the new label by July 26, 2018. However, manufacturers with less than $10 million in annual food sales will have an additional year to comply. Though it’s possible these compliance dates may be extended, companies should continue to work to meeting the existing dates in case no extensions are granted. The graphics below compare the old and new formats.